Pearl: Yes, you can train your human. Mama keeps treats in her bathroom. If I meow and meow and meow while she is getting ready for bed at night, she will give me treats. Gus just needs to jump up on the bathroom sink and Mama will turn on the water for him. 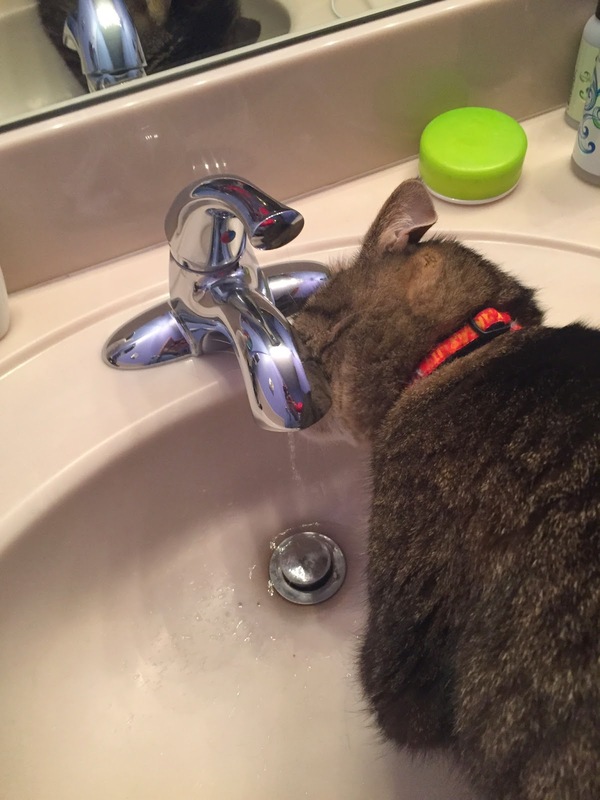 He's even got Grandma trained to turn on the water for him. To train your human, start by looking cute. Give them one of those looks that is hard to refuse. Gently nudge them to do your bidding. If that doesn't work, rub against them. Wind between their legs if you need to. Then give them one of those sweet little meows. As a last resort you can meow has loud as you can. Keep meowing until they give in to your request. Once they do your bidding, keep repeating to reinforce the behavior. Makes sure you reward them with lots of purrs and snuggles. Do you have any tips for training your human? Great job at training your humans. I can usually get a little extra food put in my bowl if I sit by it long enough. Sometimes training your humans takes some persistence! Sounds like you've got your human trained pretty well! Our Mom is a pushover and does whatever we want! That's great that you've trained your human so well!